Our roads are more congested than ever and as a result, more and more urban commuters are turning to pedal power in order to beat the hordes and bank the cash saved by binning the travelcard. But jam-packed roads can also equate to a pretty hairy journey, with vulnerable cyclists requiring razor-sharp senses and minimal distractions to avoid an unwanted meeting with a wayward taxi door or worse. 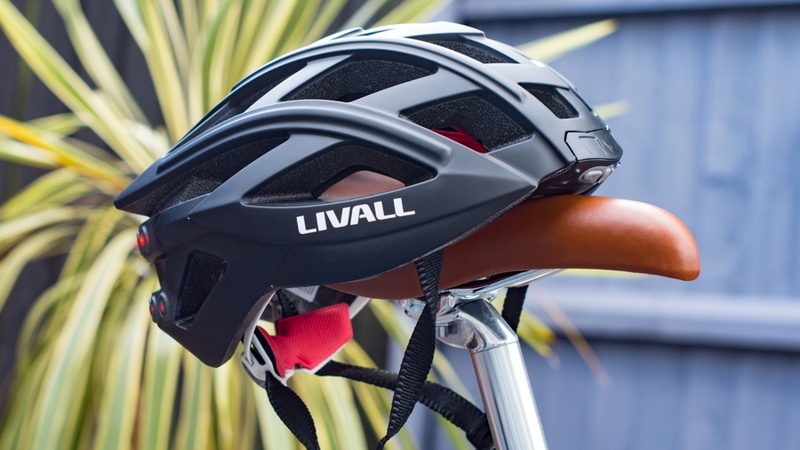 Startup Livall has been in the business of making connected riding accessories for a few years now and its latest, the BH6OSE smart helmet, has been designed predominantly with safety in mind, but is also about making the cycling experience more practical. Along with bright tail lights and turn indicators, there are also two built-in Bluetooth speakers and a hands-free microphone that allow cyclists to listen to music and answer phone calls on the move, without the need for spatial-awareness-hindering headphones. At £99, it certainly isn't the most expensive helmet on the market but it is arguably the most laden with tech. We've been taking it for a spin for a few weeks now to find out whether it's an essential piece of cycling commuter kit. Straight out of the box, it's clear that the Livall BH60SE helmet has been modelled on the sort of performance roadie lids typically found gracing the heads of professional cyclists. The stealthy black finish only serves to highlight the aerodynamic shape and tapered rear that appears to reduce drag, even if the design has never set foot in a wind tunnel. That said, it feels quite bulky when it's on your head, with the shell naturally slightly wider than standard road helmets to house the various electronics and two small speakers. It's 285g so to those more used to the sub-200g race helmets offered by the likes of Specialized, Lazer and Giro, it will feel a bit cumbersome. But bulkiness aside, it generally fits well, with comfortable padding gracing the interior, easily adjustable and soft chin straps and a rear ratchet mechanism making on-the-fly size tunings quick and easy. As for the on-board technology, the two 0.5W speakers are neatly hidden in the flanks of the helmet, while power, volume adjustment and a micro USB slot for charging are housed at the front. The clever lighting is also seamlessly incorporated into the design, with the 14 LEDs seemingly hidden underneath the outer shell of the helmet. The box includes one helmet and a small 'Blingjet' controller, which mounts to the handlebars and wirelessly controls things like the turn signals, music or call volume and power. Both the helmet and controller have to be charged via the micro USB slot and cable provided, although there's only one cable so it theoretically takes twice as long before the system is ready for use. Livall also has its own app, which is compatible with Android and iOS smartphones and takes care of most of the functionality of the Blingjet controller, as well as offering some adjustable settings of the strobing rear lights. The app is also essential for those who want to use the hands-free 'walkie-talkie' functionality which allows the rider to communicate with other Livall owners when out for a spin. Before doing that those contacts must be added into the app and a group set up. Then, so long as the helmet and Blingjet remote are connected to the app, these users can be reached by pressing the intercom button on the remote. Thankfully, the hands-free phone call option doesn't require quite as much initial set-up and it's simply a case of pairing a phone with the helmet and then using a phone as normal. Other features include a built-in three-axis gyroscope, which detects if an accident has occurred and automatically sends an alert to a chosen emergency contact as long as a smartphone is paired with the helmet, and a photo button that automatically activates the camera on the device. We'll have to admit that the first thing to strike us was just how dim those rear LEDs were during daylight hours. Livall doesn't give exact lumen output details but they aren't as bright as much cheaper standalone products on the market. We found accessing the 'flash' setting via the app improved visibility somewhat, as it quickly illuminates all 14 LEDs in quick succession, rather than the strobing just the top layer, but it was still a little disappointing. The yellow indicator lights were simple enough to operate, as a quick jab on the left or right Blingjet joypad had them flashing for a few seconds and then automatically switching off. It's probably not a good idea to ditch the mandatory arm signal completely, but the indicators do offer an additional visual prompt to any vehicles approaching from the rear. Once comfortable with the lighting, we began getting more adventurous with the functions and opted to stream some Spotify playlists during the morning commute. Hitting the centre button on the Blingjet joypad gets the music started but it requires Spotify to first be opened on the phone, otherwise it will resort to a default music library on the device. The sound quality from a pair of 0.5W speakers is never going to worry the engineers at Bang & Olufsen but describing the listening experience as 'tinny' would be an understatement. Once up to speed and pedalling furiously, the music is near enough drowned out by wind and traffic noise anyway, while the noise emanating from the helmet does draw a few odd glances from pedestrians and fellow cyclists. However, the well-placed speakers are perfectly adequate for more sedate, country lane rides and it doesn't feel as disorientating or as distracting as cycling with headphones in. It's a similar story for the hands-free call functionality, which isn't anywhere near as simple or user-friendly as it could be. First, we had to pull over and fish our iPhone out of the bottom of a bag to select a contact (no Siri compatibility here). Once dialled, we could get on our way and make the call. The sound quality wasn't so bad at leisurely speeds but the poor guinea pig caller soon started asking us to speak more clearly or raise our voice in order to be heard over the din of the wind and traffic. Receiving a call is a little simpler, as there's a button on the Blingjet controller for that, but answering a phone without caller ID always feels a bit odd and shouting into the ether to be heard while pedalling like a lunatic only served to make us look slightly insane. As previously mentioned, much of the helmet's functions are controlled via the Livall Riding smartphone app but it also doubles-up as a mini cycling computer should you wish to record rides. The interface is easy to navigate, with tabs running along the bottom that take care of ride tracking, group features, additional equipment and personal rider information. Hit the cycling button and the app will use the smartphone's GPS to pinpoint location and determine speed and miles travelled. The interface will then display live speed, timing and distance information, as well as cadence and heart rate information if the appropriate additional Bluetooth sensors are connected. Livall sells its own P1 Bluetooth cadence sensor for around £25 and it is comparatively neat with rivals considered. The small circular computer (powered by a standard CR2302 battery) can be inserted into the centre of some chain rings but we found it much easier to cable tie the little unit to the crank arm. Uniquely, it doesn't require a sensor to be placed on the crank arm and the chainstay, like many other units, and instead takes an accurate reading from one area. Once installed, the diminutive piece of kit gives live readouts of pedal revolutions via the application interface, although it comes under the heading of BPM rather than the correct RPM (lost in translation, maybe). However, to make full use of this additional live information, the rider is required to mount a smartphone to the handlebars of a bike to act as a computer. This may be fine for the casual commuter or leisure rider, but anyone spending money on lithe carbon fibre racing machines will loathe the additional bulk and will instead stick to the ecosystems offered by Garmin, Polar, Wahoo et al as they are smaller, lighter and offer far more detailed information. The app itself is also a little flawed, as we found the user experience to be slightly frustrating. For example, when recording a ride on an iPhone, it is possible to flick to a map option that harnesses Apple Maps to show current location but it requires an awkward swipe at the very bottom of the screen to return to the trip computer, which can be difficult when riding. That said, the app will record cycling data over time, allowing the user to plot longest distance travelled, highest cadence and top speeds etc, but Strava and many other free apps offer more. Livall BH60SE: Should you buy it? Overall, the functionality on Livall's smart helmet works well but the execution just isn't quite right for us. Those little speakers are just too small to properly enjoy music, while any sort of adverse wind or traffic noise is enough to overwhelm the built-in microphone. Secondly, we just couldn't get the camera functionality to work, which apparently takes a snap on a tethered smartphone via a button on the Blingjet remote. It's not a huge deal, as it would require us to hold the smartphone in the correct position to capture a good snap anyway, potentially causing the sort of distracted prang this technology is intent on mitigating. Nevertheless, the app is pretty good and can actually track ride data via the phone's built-in GPS when activated, while the rear lights add an extra element of visibility that can only help improve safety. Granted, if the morning commute is fairly quiet and sedate, the small speakers are perfectly able to handle some low quality music or a good podcast without completely blocking out surrounding traffic noise. The same can be said for hands-free calling: so long as the surroundings aren't too noisy, it's easy enough to hold a conversation while gently pedalling along. Unfortunately, we didn't get a chance to test out the group 'walkie-talkie' functionality as we couldn't track down any fellow cyclists that owned the technology, which is presumably a major roadblock to it working in the first place. But if you ignore the racy intentions of the Livall's aerodynamic aesthetic and use it for a gentler daily ride, it's absolutely fine. Just don't expect to see the pro peloton donning one of these any time soon. Thanks to Halfords for providing us with the sample for this test.